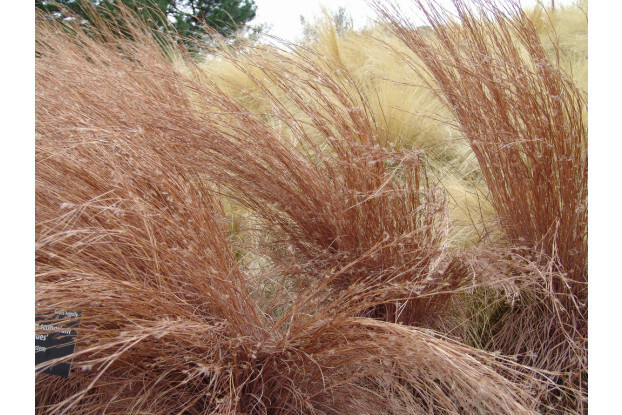 Little bluestem is a warm-season perennial bunchgrass native to much of the United States. It can grow up to three feet tall and is considered one of the most ornamental of all grasses. Beautiful fall color. It produces fair forage for livestock and its seed is eaten by songbirds and upland game birds. It prefers well-drained infertile soils and is very drought tolerant. Will not tolerate damp, wet soils. It can be grown without irrigation in areas receiving at least 12 inches of annual rainfall.